SystemUiFlagVisible – Makes the Navigation Bar visible. SystemUiFlagLowProfile – Dims out controls in the Navigation Bar. SystemUiFlagHideNavigation – Hides the Navigation Bar. 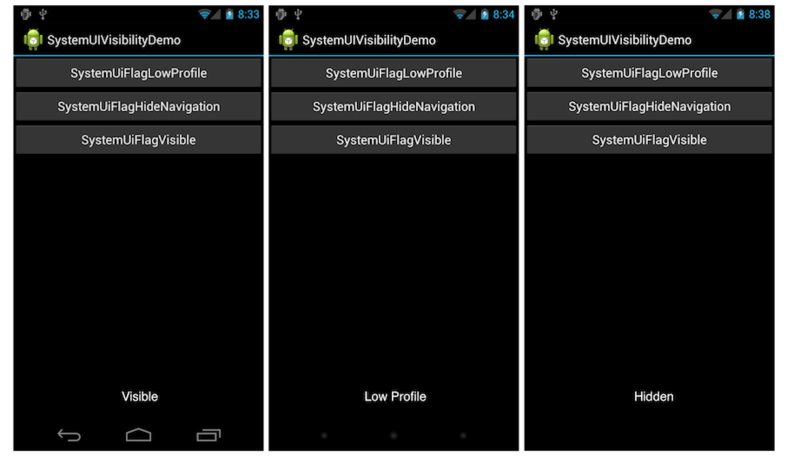 These flags can be applied to any view in the view hierarchy by setting the SystemUiVisibility property. If multiple views have this property set, the system combines them with an OR operation and applies them so long as the window in which the flags are set retains focus. When you remove a view, any flags it has set will also be removed.